So much for the Swiss Army Knife. Modern life is filled with little emergencies we never thought we'd have 20 years ago. Let technology come to the rescue once again with these innovative, on-the-go widgets. Even collectively, they take up so little space in your pocket you'll forget they're there - except when you need them. Whether you're broken down on the road or deep into a forest trail, these workhorse flashlights put that keychain penlight to shame. These lightweight aluminum torches have three power-saving modes to ensure a long life for the single AA battery, but they ramp up to a one-mile range if you really need to shine. The adjustable zoom makes them equally ideal for exploring caves or the crannies of an overheating engine. Buy now: UltraBright 500-Lumen Tactical Military Flashlight: 2-Pack for $11.99. If you've ever tried to match swatches to an existing paint job, you know the humbling limitations of the human eye. Here's where Nix comes in. Scan any surface, save it to a phone or tablet and the software will match it to one of 31,000 shades from any leading paint brand or to the exact RGB, HEX, CMYK or LAB color. See why CNET called this the #1 Paint Color Matching Tool. Buy now: Nix Mini Color Sensor at a 30% discount of $69. Say hello to your new best friend. The even more petite companion to the popular Twisty Glass Blunt is here, with a valuable upgrade in the 50% smaller cherry. Just pack your tobacco of choice, twist, and light. The five chambers deliver a silky-smooth hit, and cleanup is as easy as unscrewing the cap. Buy now: Twisty Glass Mini at $39.99, more than 20% off. Whether you're at family gatherings or business socials, chances are somebody's going to need a cell phone charger at some point. Hey, it might even be you. Stock up the glove box with a 3-pack of these extra-long, durable chargers and you'll never be without a jolt. Buy now: 10-Ft Lightning Cable: 3-Pack at $24.99, 50% off MSRP. 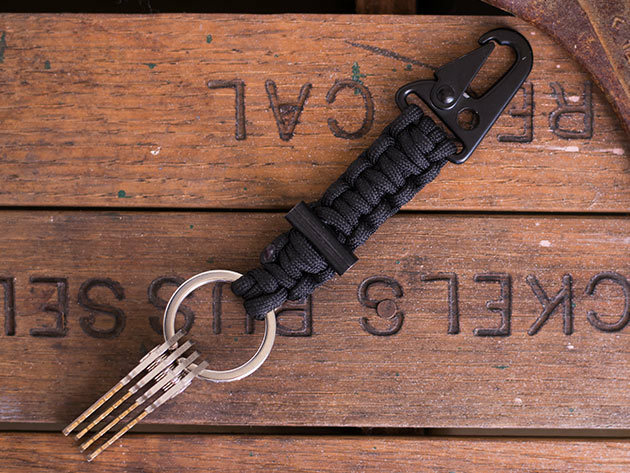 Why can't your keychain be useful for more than just holding your keys? In a pinch, the Carabiner spools out into 1.5 meters of military-strength paracord, tested for 550 pounds and usable for a range of outdoor activities including fire starting and snares. With a lifetime guarantee, you'll feel better in any situation just having this around. Buy now: Bomber Carabiner Paracord Keychain 52% off at $10.99. There's no need to toss out those trusty earbuds if you want to catch up on the latest wireless earphone tech. This receiver essentially converts them into wireless buds with Bluetooth 4.1 capability that connects to your phone, or whatever device your earpieces are paired to. Perfect for the workout or commute. Buy now: Atech Micro Bluetooth Receiver at 60% off for $19.99.